The origin is the center of the torus. The surface is obtained by rotating a circle around the "main Direction". This circle has a radius equal to the minor radius, and is located in the plane defined by the origin, "X Direction" and "main Direction". It is centered on the "X Axis", on its positive side, and positioned at a distance from the origin equal to the major radius. This circle is the "reference circle" of the torus. Rotation around its "main Axis", in the trigonometric sense given by "X Direction" and "Y Direction", defines the u parametric direction. The "X Axis" gives the origin for the u parameter. Rotation around an axis parallel to the "Y Axis" and passing through the center of the "reference circle" gives the v parameter on the "reference circle". The "X Axis" gives the origin of the v parameter on the "reference circle". A3 is the local coordinate system of the surface. The orientation of increasing V parametric value is defined by the rotation around the main axis (ZAxis) in the trigonometric sense. The parametrization of the surface in the U direction is defined such as the normal Vector (N = D1U ^ D1V) is oriented towards the "outside region" of the surface. Warnings : It is not forbidden to create a toroidal surface with MajorRadius = MinorRadius = 0.0. 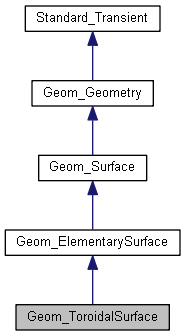 Creates a ToroidalSurface from a non transient Torus from package gp. Computes the aera of the surface. Returns the parametric bounds U1, U2, V1 and V2 of this torus. For a torus: U1 = V1 = 0 and U2 = V2 = 2*PI . Returns the coefficients of the implicit equation of the surface in the absolute cartesian coordinate system : Coef(1) * X**4 + Coef(2) * Y**4 + Coef(3) * Z**4 + Coef(4) * X**3 * Y + Coef(5) * X**3 * Z + Coef(6) * Y**3 * X + Coef(7) * Y**3 * Z + Coef(8) * Z**3 * X + Coef(9) * Z**3 * Y + Coef(10) * X**2 * Y**2 + Coef(11) * X**2 * Z**2 + Coef(12) * Y**2 * Z**2 + Coef(13) * X**3 + Coef(14) * Y**3 + Coef(15) * Z**3 + Coef(16) * X**2 * Y + Coef(17) * X**2 * Z + Coef(18) * Y**2 * X + Coef(19) * Y**2 * Z + Coef(20) * Z**2 * X + Coef(21) * Z**2 * Y + Coef(22) * X**2 + Coef(23) * Y**2 + Coef(24) * Z**2 + Coef(25) * X * Y + Coef(26) * X * Z + Coef(27) * Y * Z + Coef(28) * X + Coef(29) * Y + Coef(30) * Z + Coef(31) = 0.0 Raised if the length of Coef is lower than 31. Creates a new object which is a copy of this torus. Computes the point P (U, V) on the surface. P (U, V) = Loc + MinorRadius * Sin (V) * Zdir + (MajorRadius + MinorRadius * Cos(V)) * (cos (U) * XDir + sin (U) * YDir) where Loc is the origin of the placement plane (XAxis, YAxis) XDir is the direction of the XAxis and YDir the direction of the YAxis and ZDir the direction of the ZAxis. Returns the major radius, or the minor radius, of this torus. MajorRadius - r is less than or equal to gp::Resolution(), where r is the minor radius of this torus. R - MinorRadius is less than or equal to gp::Resolution(), where R is the major radius of this torus. Converts the gp_Torus torus T into this torus. Returns the non transient torus with the same geometric properties as <me>. Applies the transformation T to this torus. Return the parameter on the Ureversed surface for the point of parameter U on <me>. Return 2.PI - U.